One of my reading goals for 2013 was to "Read something less well-known by an author I liked." When I made the goal, I had my eye on a few authors, one of them being Karen Hesse. Ever since reading (and loving) Out of the Dust, I have wanted to read something else by her. I didn't know what to expect, but what I found was that Safekeeping bore very little resemblance to Out of the Dust. Out of the Dust is written in free verse; Safekeeping is written in prose. 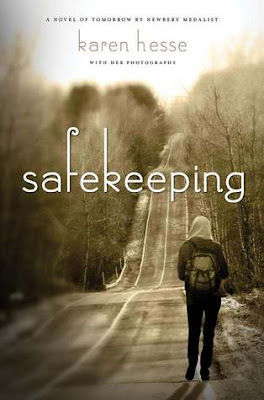 Out of the Dust is for middle graders; Safekeeping is for young adults. Out of the Dust is historical; Safekeeping is futuristic. Out of the Dust is text only; Safekeeping includes 90 original photographs. I can't say I loved it as much as Out of the Dust. That would have been difficult since I love that book tremendously. However, I definitely liked Safekeeping. It was really refreshing to see how Karen Hesse can (successfully) write in two very different ways. As the cover states, Safekeeping is "a novel of tomorrow." The reader is never told the year...it could be five years from where we are now or fifty. I have no doubt this was intentional. It lends a timeless quality to the novel--in theory, these events could happen anytime; because we don't know when they were supposed to have happened by, they are still a possibility in the legitimate future. When the story opens, 17-year-old Radley is on her way home from Haiti, where she has been volunteering in an orphanage. She has just received word that the American People's Party in the United States has taken power. She knows this will not have good results, and so she feels a driving urgency to get back to her parents. When she lands, there is no sign of her parents at the airport, even though the head of the orphanage sent word that she was coming home. 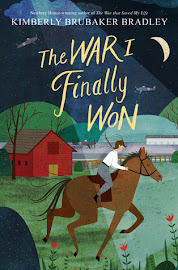 Radley waits but eventually assumes her parents didn't receive the message and so starts out on a 60+ mile walk to her hometown of Brattleboro, Vermont (where the author currently lives, by the way). Being an only child, Radley isn't at all used to making her own decisions and fending for herself. She is more than a little proud of herself when her home comes into view. But that short journey turns out to be only the beginning. Her parents are not at her home, and it is obvious they haven't been there for quite some time. Fearing they fled because of their opposition to the American People's Party, Radley decides to head to Canada, hoping to find her parents along the way or at least wait things out until the government fixes itself. This is not your typical dystopian novel. In fact, I probably shouldn't even describe it as dystopian, but a more appropriate term alludes me. Yes, the government falls apart as different groups fight for control. Yes, there is violence and fear. Yes, freedom is suddenly a rare gift. But Radley (and by association, the reader) is far removed from all of this. By the end of the story, the government is establishing itself once again and the chaos has ended, but Radley did not have a hand in helping this happen. (In fact, at one point, Radley says, "They have nothing to fear from me. They never did. I don't want to topple a government.") So really, it is more about Radley's own journey and self-discovery. The political side of it merely sets the stage and then takes a quiet backseat. That said, there is an undeniable political undertone to the whole story, and while I think "agenda" might be too strong of a word, I can't help but think that Karen Hesse is trying to get some personal point across. I have to admit that when it comes to politics, I am pretty oblivious. Occasionally, Mike will bring me up to speed on some important issue so I don't make a fool of myself during casual conversation. Maybe if I were more politically minded, I might have been able to tell who the American People's Party were supposed to be, but I'm afraid that although I could sense it through the whole book, I couldn't apply Hesse's forecast to real life. Although this book is not written in free verse (as I already mentioned), Hesse's writing is still stunningly lyrical. Sometimes it almost reads like a poem. For example, there's a part where Radley is remembering a dress given to her by her grandmother. The dress was made of a yellow fabric with brown horses on it. Radley could never bring herself to wear it. Then she says this: "I feel a deep pain, like a punch to the gut. I'd wear it now, if only I could have my parents, my grandparents, my old life back. I'd wear it now." One of the truly unique things about this novel is that it contains 90 of Karen Hesse's own photographs. I have to say that while the story itself was a tad lukewarm for me, the photographs made it so vivid and real that I found myself entranced. It wasn't that the photographs were amazing per se (although there were some that I truly loved) but that they complemented the story perfectly. Really. In the author's bio at the back of the book, it says, "Despite having a vast body of existing images to choose from, Hesse was determined to travel the entire route herself at the same time of year as Radley." Some of the photgraphs are beautiful, some are frightening, some are peaceful, some are breathtaking, but they all are authentically real. Even though Radley is fictitious, the images were real, and they made the story come alive for me. I didn't find them distracting (even though there's one on nearly every page for the entire middle section), but rather, I felt like I was walking with Radley and observing a field here and a flower there...things that she herself didn't mention but which were there just the same. This story features a very small cast: really there's only Radley, Celia (who travels to Canada with Radley and becomes a dear friend), Madame Seville (an unknown benefactress for much of the book), and a young man named Julian (oh, and Romulus the cat and Jerry Lee the dog). This lack of superfluous characters made the story feel more close-knit and personal but also a little bit isolated and lonely. Celia especially is very quiet and tight-lipped, and so even though she plays a part in most of the book, it takes a long time to get to know anything about her. I felt like Radley's tie to Haiti was a little contrived. It seemed more like the author loved Haiti and wanted to raise awareness and sympathy and less like it fit into Radley's story. 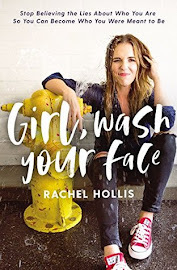 Which is a funny, and maybe false, observation considering the fact that Radley is in Haiti when the book begins, thinks about it through her entire journey, and goes back to it at the very end, so it actually plays a huge part in who Radley is. But it still felt forced to me, like the author wanted it there, and so there it was. I have to say that my biggest gripe with the book was over something ridiculously small. So the main character's name is Radley, right? Radley. A name I can't say I'm particularly fond of. But then, you might remember, I have a son named Bradley. A name I happen to like quite a lot. Radley and Bradley. They sound so similar, and yet I dislike the one and love the other. Somehow, my brain couldn't reconcile these two facts, and so the whole time I was reading the book, I cringed every time I said "Bradley" because all I could hear was "Radley." I was worried (and resentful) because I thought this book was forever going to taint my love for my son's name. Thankfully though, this phase seems to have passed, and today was the first time in days I've remembered the similarity. This isn't a book I would urge you to rush out and buy right now, but I wouldn't discourage you from reading it either. 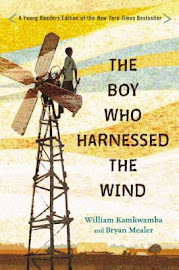 It's quiet and slow-moving but deep and tinged with meaning. I was glad to have read it. P.S. I actually love the cover image. Don't you? This sounds good. You're review is eloquent. But I'm not sure I could stomach the politics. That's a pet peeve of mine.